I am finaly near the end of my build of a seq4. Only need to have the Aout_ng and possible the D-out working. The D-out I will try to build on a breadboard for some extra gates and clocks. Realy looking forward for the awesomeness of controlling a modular with the midibox. Thanks again TK for bringing the AWESOME project to the public. Would you have any idea what can be the issue here with my aout_ng? Does anything below indicate wrong wiring? And on the CV Configuration Page the aout_ng is set. No led is enabled on the Aout after booting the midibox and the DAC is not getting warm. [6016.659] Setting AOUT:CS pin to ca. 5V - please measure now! [6016.659] Setting AOUT:CI pin to ca. 5V - please measure now! [6476.996] Setting AOUT:SC pin to ca. 5V - please measure now! Does anybody has a hint what I should check? Testing not on the DAC but on j1. I also learned that you have to set the pin low manually after a test otherwise it stays hight. Hmmm hope I did not burn anything. Run testaoutpin cs - si - sc with 1 and 0 and look for the switch in voltage at the pins, if you get that then all your wiring & config is good. Which LED are you expecting to flash? there is only a power LED on the AOUT_NG PCB. "You can leave out the TL074s for a first test. Then connect J1 to the core. Power up your Midibox. If the LED doesn't light up, IMMEDIATELY switch off power and re-check all connections and soldering." "If the LED is on, you can now connect analog power (+/- 12V) to J3." So the wiring seems good. If LED1 does not power up then you are not getting power and/or GND to the board, or the LED is no good. Recheck connections and be sure the wiring is correct , the J19 to Aout_NG is non standard and not 1 to 1 pin placement. 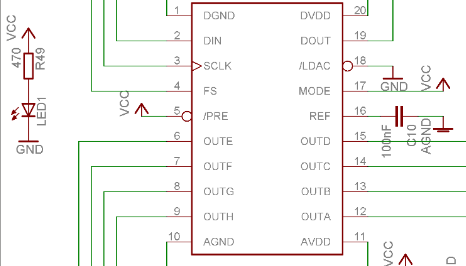 Ohhh no I removed the DAC yesterday but looking back to my notes I actually had 5v on pin 5 on the dac (/PRE ). So there is a high change that I have the LED connected wrongly. I mean 5v on the /PRE input should light up the LED right? Would wrongly placing the led mean a non working aout? If the led is wrong I will re solder the old DAC first otherwise I will bet on a new one. I mean 5v on the /PRE input should light up the LED right? No, not if you installed the LED backwards. The LED only indicates power is available at the PCB, the Aout_NG would work without it. Remove the LED, test it with a 9v battery and resistor, if it lights install it the right way and if you didn't damage the DAC on removal, re-install it. I will get a new one. And will report back here. I'd very interested to hear your report and I really hope it works for you. I could not get my Aout_NG working and gave up after many tries, 1 or 2 other people have experienced the same thing after doing everything right, so your input will be welcome. I bought my DAC from ebay and to be honest I am now buying it from mouser so I have more trust in it. I will report back here in a while. Ok I got a new DAC. [24708.300] Setting AOUT:CS pin to ca. 5V - please measure now! [24683.868] Setting AOUT:CS pin to ca. 0V - please measure now! [24742.891] Setting AOUT:SI pin to ca. 5V - please measure now! [24755.116] Setting AOUT:SI pin to ca. 0V - please measure now! [24775.452] Setting AOUT:SC pin to ca. 5V - please measure now! [24790.716] Setting AOUT:SC pin to ca. 0V - please measure now! A new dac is soldered which I carefully inspected. Now +-12v is connected to j3. On the TL074s +-12v is measured that is pin 4 +12v. In bipolar mode I get about -2.6v on all 8 channels, caliaout 1 max does nothing, neither does changing the calibration voltage on the midibox itself. I am trying to find very hard if I soldered something wrong but that it doesn't seem like that. Anybody any tip what I should do? Ah I seem to have sucses. When I disabled th aout_ng in the config, saved it and turned the midibox off. Then turned it on again, selected - aout-ng and tweaking the calibration voltages gives me output!!!! ITS ALIVE!!! I will continue the tests another day. This is good news. It might help me in my quest to get Aout_NG working, thanks for the update. Hi Slo, i hope you will solve it and make it working. I still did not have time to do the full testing. Anyhow good luck and maybe post you progress here. But for the records: currently I'm not able to reproduce this issue. Only 1 thing i did not mention is that I applied a bit off pressure on the tl074's so most likely i did something wrong. Maybe the contact wasn't ok before. Althought +-12v was there. I will try if i can reproduce it on my side. But if i do than highly likely I did something wrong here. I am not able to reproduce the bug at all. Aoutng just working fine.